William J. Pendray started his soapworks in 1875 at the corner of Humboldt and Douglas Streets, on the north shore of the James Bay Mudflats. At one time, the factory turned out 40,000 pounds of soap a week. The first telephone line in Victoria was installed between the soapworks and Jeffree’s Clothing Store (owned by his uncle) at the corner of Government and Yates Street in July 1877. Following the construction of a stone retaining wall and the draining of the mudflats in 1900, Pendray sold his land to the C. P. R. At about the same time, he acquired the Canada Paint Company, changing the name to British America Paint Co. (known as BAPCO). Jacob Sehl had founded a furniture factory at Laurel Point in the late 1870s but when the building was destroyed by fire, Pendray purchased it for his expanding business and moved operations to Laurel Point, joining other industries in the area. It is likely that he chose the new site for its proximity to his home. BAPCO paint was still being produced into the 1970s. In 1895, William Pendray and his wife Amelia commissioned architect Alexander Charles Ewart to built their family home. Located at 309 Belleville, it was an instant landmark. Rising 2 1/2 storeys from the ground, the home features a Queen Anne octagonal tower. The house is clad in different types of shingles in a variety of complex patterns. The entire structure contains voids and solids in a never ending flow. The interior was as fine as the exterior with frescoes by German artists Muller and Sturn in the main rooms and fine woodwork throughout. The property was also known for its collection of late Victorian topiary in the extensive gardens. Unfortunately these examples have been lost in the transition from one use to another. 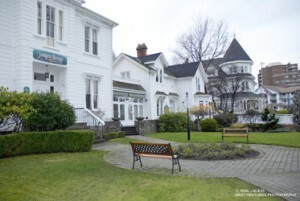 in 2009, the property is currently a bed and breakfast and restaurant.